Home » Posts Tagged "blank keyfobs"
the use of plastic keyrings, can attract new customers while at the same time further inspiring loyalty. The targeted use of blank keyrings in any promotion has been widely adopted by many companies over the years looking to promote and raise profile of the brand. Using our blank plastic keyrings as part of your promotion can prove to be an essential and cost-effective marketing technique. Clearly the end result should be to get attention for your business or brand and build name recognition, one thing that`s absolutely proven is the use of our plastic keyrings,they can attract new customers while at the same time further inspiring loyalty. The other great thing about our blank keyrings for instance is that they are available straight from stock in a plain state ready for you to insert your own designs , logo etc ,www.keyring-creator.co.uk specialise in the supply of all types of blank keyrings and keyfobs and many other blank photo products. With a huge range of different promotional keyrings and photo keyrings on the market, making the right decision on the right promotional items and even the right supplier of keyrings for your business can be literally overwhelming. 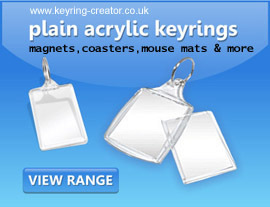 Our simple to use website contains a large range of keyrings that are blank and keyfobs second to none. Using the links on our website you can choose the right keyrings for you.